Happy New Year! I was thinking about the new year that is upon us and how excited I am to be running THREE Community choirs in good old London Town in 2013. It is interesting how people get to join and find us. As none of the three choirs have the name ‘community choir’ in their titles, they fly under the radar a bit, and most people join because of word of mouth, which is a wonderful thing. A community choir, as I am lead to understand, it is a group that usually has no auditions and does not tend to use notation – so it is singing for all, both experienced, inexperienced and returning singers…it’s like the idea comprehensive model…everyone grows. No judges, we sing because we love it….we ‘share’ not perform…none can ask for a refund…the audience always get a chance to join in. Of course different groups will suit different singers. I have heard it told, oo aaarrr, that my choirs have a level of difficulty, due to the fact that some of my choral arrangements are sometimes quite challenging. The thing is, we have weeks of practicing, and going over things over and over, in little bite sized chunks and I put recordings of all the parts on my website, so singers get to download, listen to them on the train, in the car, while jogging ( perish the thought!) Only once did a newcomer run from the building at the end of the first session because he said he would never keep up. I pleaded, but he would not have it….I blame myself…who else is there to blame? If he had stayed he would have been fine, as people in community choirs are team players, help each other, not every one is as experienced to begin with. When a group has been running for a while, and The Bishopsgate Singers has been going for over 7 years, people will naturally become more experienced and delight in the challenge of some meaty pieces, but still welcome newcomers every term. Our repertoire spans so many genres, last term we ‘did ‘ the 80’s. This term we are going to visit Gershwin, Cole Porter, Bob Marley and the Rolling Stones, for starters! The Tubthumping Chorus -a choir nestling under the large umbrella of ‘folk’ repertoire which starts in about a week will not leap into challenging vocal arrangements straightaway, but I do like to challenge people, and if you teach with bravery and a clear vision, having confidence, knowing where the finishing line is , and your singers are up for the challenge and willing to stay with the journey I think we can try all sorts of music. If you are not so brave, your musical choices can be a bit limited sometimes. The Acland Burghley Harmony SIngers are about to start their official second term on Jan 30th. I am attaching a video taken on a shonky little camera of one of the songs we shared for the first time at the end of our first 6 week season. 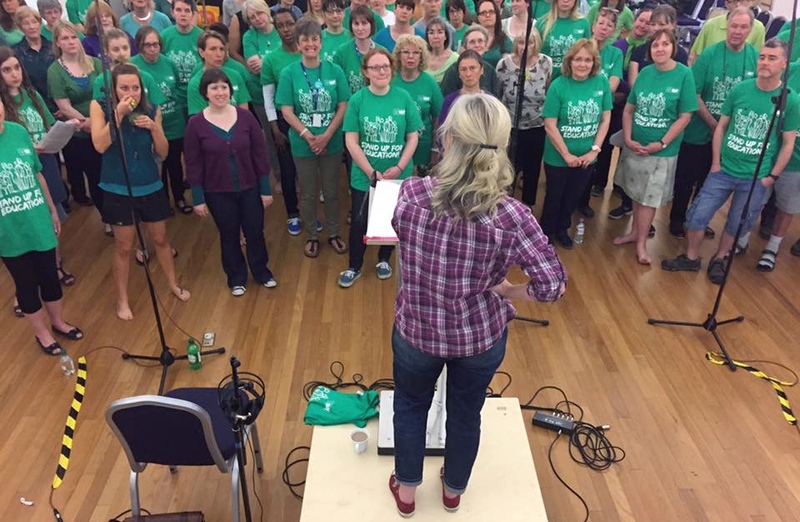 This again is what I would describe as a real community choir – run by the school, The choir is a mixture of teachers, parents and locals, which means I get to recognise more of my neighbours, so the community choir is not just abut the singing, it is about making connections – and new friends.